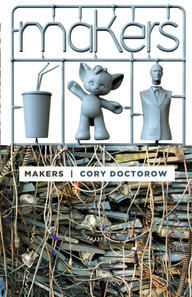 I am a big fan of Cory Doctorow's work. Without planning to, I have actually read his entire oeuvres on screen. If I ever came across a paper copy of one of his books, I would love to pick it up, but I haven't seen one at the airports I frequent. It started when I was living in China in 2004, I downloadedDown and Out in the Magic Kingdom and Eastern Standard Tribe, and read them both on my 17" creaky Linux laptop, using a program that very much resembles Tofu for Mac - full-screen reading with columns and no scrolling (I hate scrolling when reading a lot of text). At that time, I was very excited by the idea that I could read interesting, cutting edge stuff in English while living in China - in the bookstores the only thing I could find were English novels that had entered the public domain, Pride and prejudice and so on. just wanted to drop you a quick note, while it's still fresh in my mind, that I really enjoyed your book. It's 0:40 at night here in Hangzhou, China where I currently reside, and I just watched the last page on my laptop. In fact, it's also the first fiction book I've read in entirety on my laptop (I've obviously read page upon page upon page of other material). The use of a freeware reader (ubook) that let's me flip pages instead of scroll, helped a lot, in fact I got really into the book, as I was curled up on my couch. This is one book that I probably would've never read, if it were not publicly available - I live in China currently, where I certainly wouldn't be able to buy it, neither would it be available, I suspect, in Norway, where I was born. In a few months I am moving to Toronto to study, there I might even have the chance to catch you at a reading, which would be fun. Anyhow, I found your site through the Lessig-reading project on AKMA's blog (which I don't even remember how I found), which I thought was really cool. I really support the CC license, and marvel at the imagination and cooperation that it unleashes at its best. One point about copyright that is seldom mentioned in the discussions I've read online - which tend to be very US-centric - is the developing world. Keep up the good work, hope I'll be able to catch you when you're in Toronto some time, and I do hope you're second book isn't as good as the first, otherwise I shall get very little sleep tonight. PS: Don't feel required to reply, just wanted to let you know. Cory graciously wrote back and said he couldn't make a living off books either, he was working for the EFF, and that he'd be moving to England, and hoped I'd like his other books. I kept up with his short stories, his posts on Boing Boing and so on, and a few years later I'm a BA student (mature :) at University of Toronto, and I'm doing an internship at a co-op of disabled (but more able than most of us - I can't weld a wheel chair from metal tubes!) in Northern Mexico. Part of my job was to help them rehabilitate the internet cafe (which they used themselves, and which was also a source of income, and encouraged interaction between all the kids in town, and the people living in the co-op). We helped them set up a satellite link, so their internet wouldn't go down every time it rained (their phone lines were quite ... cantankerous), and I remember sitting in the lab, helping them work on their webpages, when I saw a notice that Someone Comes to Town, Someone Leaves Town had been posted online. I pulled up the first page on my screen, to read the introduction, and I couldn't stop. I think I sat in that shack the entire day, until I finished the book and my eyes hurt. I remember writing you a note about three years ago, when I read two of your novels (one about Disneyland and one about timezone cliques) online while living in a small apartment in Hangzhou, China. Later, as I was volunteering in a small community in Mexico, I read your novel set partly in Kensington Street in Toronto, and absolutely loved it! At the time (still, technically) I was studying at UofT (Int'l dev'l studies), and after that summer (in Mexico) I actually moved into a shared apartment in Kensington market (right across from the Supermarket bar, if you've been there recently). I always love place-specific literature (or movies) (indeed I think it's horribly sad that English-speaking Canada doesn't have more specifically local culture - there are some awesome movies that could be made in Canada, love stories in Scarborough, action thrillers in the CN Tower), and ever since I began living in Toronto I've been looking for cultural references to the place. Currently, I'm in Jakarta, Indonesia - on an internship with CARE from UofT, and I just spent the last three days sick, and listening to your first six lectures from PWNED (lucky I randomly downloaded them the day before I became sick - no internet at home). While very little of the material was genuinely new to me - I even remember when I heard about some of it (like listening to an IT conversations about feral robotic dogs on a Greyhound from Toronto to Buffalo to see my girlfriend), it was a nice companion when I got sick of watching HK and Korean pirate movies (which I'd also unconsciously stocked up on a few days earlier). Anyway two short comments on the course material. In the first lecture you talk about renting and owning - from the perspective of DRM and software services, but also drawing in a bunch of real life metaphors, and concluding that renting is for poor people (or corporate) and everyone really wants to own. Perhaps my point isn't even very relevant, but I think there are a bunch of times when renting, or owning cooperatively or whatever makes a lot of sense. (Yes I used to be a communist/anarchist, and I'm still on the left, although much more complicated). One good example are car-pools, both communal and the new corporate ones like Zipcar and stuff. You might need a car just once in a while, but if the choice is to own one or NOT to have access altogether, you would probably choose to buy one (if you could afford it). If the option was to only pay for usage, not only would you not have to buy one (thus reducing the amount of cars produced, and perhaps also the amount of people driving around with old cars), but you would probably also use it less. Is it technically more practical for you to own one than to rent one - in that you can use it whenever you please? Yes. But to me that is a too selfish argument that doesn't take into consideration all the costs. In the same way, and this might be a very Scandinavian mindset (I'm Norwegian), I'd love to share a lot of life's necessities. As a young single man, I live with friends, and we share kitchen utensils, a TV in the living room, an exercise machine, etc. On a bigger scale, in the Scandinavian countries, it's very common for people living in apartment buildings (they often own their own apartments, but these are very simple things - not at all this whole condo concept that I've never understood from Canada/US) to share a lot of things between the whole house. Like having a bunch of industrial clothes washers in the basement. And a room that is heated with an air-dehumidifier, where you can hang your clothes. Every single Finnish apartment complex has a sauna in the basement. In some Swedish cities they have community centers where you can borrow tools. On WorldChanging they wrote lately that the average American power drill is used for six minutes during its lifetime. I understand that the American inclination (I'm not saying this is necessarily your inclination) is to make so much money that you can buy an extensively big house in the suburbs, fill it to the rafters with clothes washers, power drills and five TVs, and then drive your SUV to town. But that's not my ideal life. I want to live in an affordable apartment complex downtown in a lively and vibrant cosmopolitan city, where I have access to the things I need in life - whether a car once in a while (I cannot drive, but still), a power drill, a sauna or washing my clothes. I would even love to put a mini movie theater (that could play anything) in the basement, with an LCD projector and a DVD player, and let people sign up for it. I would find it over-the-top to invest in this for my own place, but sharing it with fifty others, and being able to use it once in a while... In a big apartment complex in Sweden (but very affordable, as mentioned) they even had a guest room that could be rented for 10\$ plus an extra 5\$ for sheets by anyone who lived there and signed up. Beautiful for the people who want to live small - but still have space to put uncle up when he comes by. (Maybe you were completely aware and completely support all of this, and maybe not. I just felt like pointing it out. And I'm still against DRM :) Although I think software as web services, which don't require companies doing weird stuff to your computer (although it unfortunately usually requires you to store your data online - which has very big implications) is going to get a lot bigger. The second point was related to pirated DVDs. I've been quite interested in the pirate DVD market in Indonesia for a while, and also asked a few of my local friends, one director and one underground filmmaker. Partly, they say most of the DVDs are made in Hong Kong or Bangkok, partly they also say that individual sellers are usually under local "preman" (kind of local ruffians/mafia). But I don't think the preman controls the distribution system, I think they are more about real-estate protectionist rackets. I would love to read a long detailed article about how the whole chain works, who decides which works to provide, how it moves down the chain. Part of the reason it's done centralized is that it has to be translated to Indonesian, because the selection is staggering (they even have their own "festival" racks, with stuff from Germany, France, Italy, Russia, Turkey), and many times bigger than the number of officially imported and published Hollywood movies (that already have official Indonesian translations). Usually the DVDs here come with subtitles in English, Indonesian, Chinese (two versions) and Thai. (Sometimes Malay instead of Indonesian, which are mutually intelligible). Of course, the translations are usually completely horrible, indeed on one they had used an automated translation program to get the English subtitles back from the Indonesian translation (this was an original American movie) - I know this because odd misspelled Indonesian words made it through to the English translation - it had just been ignored by the translation program. I am interested in this partly out of interest, partly because I am wondering whether it would be possible to harness this amazingly efficient chain of cheap DVD distributors - available everywhere at prices that are accessible to normal people (around 60 cents for a DVD) - to distribute other stuff. I recently subtitled a Norwegian movie in Indonesian with a friend, and really want more people to be able to watch it. (I'm not exactly feeling guilty because I am undercutting their potential earnings in Indonesia...! :)) But I am also thinking about Linux distributions, compilations of Creative Commons music, or even static Wikipedia versions (I've been working on a Rubyscript that let's you access a Wikipedia HTML dump file directly on localhost, without unzipping the file. Because of limitations of 7zip, which I'm hoping to overcome, it's still very slow - so slow that trying the English version is out of the question. But for small languages like Indonesian (60MB 7zipped), it's still quite usable). I could ramble on, but I'll stop here. Anyway, enjoy your stuff, and I'm looking forward to reading more of your stories, and listening to your podcasts in the future. PS: I am just opening my laptop to add this before I go to sleep, I think the potential for distributing useful legal stuff on DVDs etc is very high, but it sometimes seems that a lot of the people doing cool stuff just expect always-on connectivity, whereas here in Indonesia, even when you have internet connection, it's very slow and expensive (even at the main office of a major international NGO, downloading a few gigabytes is unthinkable). Putting Wikipedia on a DVD is one thing, and it was inspired by my own desire to have it accessible when I'm home at night, and want to look something up. This of course also extends to non-computer stuff, like putting Gutenberg books, Librivox podcasts (the combination of Gutenberg books and Librivox podcasts of the same title is awesome for learning English - my girlfriend in China used to listen as she read along all the time, and I do this with Chinese), ... sky's the limit. Did I mention the MIT CourseWork stuff? Throw it in! Of course, language is a barrier, but many people have functional English, Ruby code can be read by anyone (although I think good textbooks for Ruby are still really needed in Indonesian), Wikipedia is in Indonesian, and there might be other great resources in Indonesian out there as well. Or this could partly function as an incentive for people to create more Creative Commons documentation in Indonesian, translating etc. This isn't meant as a concrete proposal or anything, I just suddenly felt like sharing it. But I'm definitively adding it to my list of ideas I'm going to look into implementing, and perhaps it's something you can keep in mind as you travel around and meet interesting energetic people. I'd love your thoughts. As for my idea about offline access to Ruby, I talked with a lot of Indonesian Ruby activists about this, and they were quite enthusiastic. It even got included into the "ideas for future features" for BlankOn Linux, an Indonesian distribution. (It also garnered some discussion on the international Ruby mailing list).I don't know if anything came out of it, however. Moving along. In 2007, I attended iCommons in Dubrovnik, and had a chance to listen to Lawrence Lessig, Joi Ito, Yochai Benkler, and Cory. I even ran into him briefly on the last day, and said hello. Then I finished my BA, and the following summer, I went to China where I spent time with the Rural China Education Foundation visiting two rural primary schools, and writing a report about their fledgling community libraries (I was invited to do this, because of my research on community libraries in Indonesia for my BA thesis). In one of the villages, we slept in a new "compound" built for the local village administration – one morning, I woke up by a man entering the room, and sitting down at the PA system next to my bed, to broadcast a message through all the loudspeakers in the village that villagers had to remove the wheat they were drying on the main road within noon, or face fines. I've read all of your books, and love them. 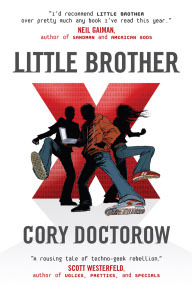 I even sent two copies of Little Brother to schools in Latin America, which was a brilliant way of supporting you and your publisher. I'm excited that Little Brother is getting official translations in many different languages (including Norwegian, my native language - I live in Toronto, but it was fun seeing the Norwegian twitterati getting excited about listening to you speak in Oslo). I definitively think you should link all these different language versions on the Little Brother website (I couldn't see it anywhere). But to take this further... I speak a bunch of languages, and am very interested in language learning. One thing I've found hugely useful when studying Chinese and Russian for example, is parallel texts. Ie, books where you have English (or another known language) on the left pages and the exact same text translated into Russian (or Chinese) on the right hand sides... This enables you to read much more interesting literature than your textbook, and you always have the translation available to check words, see how it would be formulated in another language etc. The problem is that it's extremely hard to come across such books. In Russia, I found a book called "Jonathan Livingston Seagull", and read the whole thing (slowly, my Russian is poor), learning lot's of verbs for swooping, diving and batting wings... It was such a great experience, that I really wanted to find more. I even had a Russian friend help me call the publisher, but we were unsuccessful in hunting down more titles. In China, this sort of thing is fairly common, however it's applied to books that are out of copyright (Gone with the wind is the classic), because then Chinese publishers don't have to ask anyone's permission. Needless to say, such books are neither great for foreigners trying to learn Chinese, nor for Chinese trying to learn English (their target audience). So I guess you can guess where I'm going... Doing something like this with Little Brother would be awesome! It's a much more interesting and engaging read to most people, and since there are already a bunch of translations out there, hopefully most of them using open licenses, this could be an incredible resource. Thanks for writing great stuff (and doing important activism)! He wrote back and said that most of them hadn't been published yet, and anyway it was hard to get foreign publishers to agree to license the translations under open licenses. I still think this is a great idea, try out 4Lang for one example (obviously you'd want a much slicker interface) - it's A Doll's Home in Norwegian, Russian, Chinese and Esperanto. You can at any time switch which language is displayed on the left, and on the right, without loosing your place. The interface is in Norwegian, but you should be able to figure it out. Back to Toronto, I began my MA at OISE, and I even got an iPod. I remember reading After the siege. I finished reading it while walking down the street to the subway station, and when I had read the last line, I had to stop in the middle of the side walk and stand for a while. It was such a tragic story. I was at a very boring conference, and checking my Twitter-feed when I saw that Makers had come out, I downloaded it straight away to Stanza, and was reading the whole way home. The book was incredible, I devoured it on my iPod. And today, I just downloaded his newest book For the win, and began reading it over lunch (on my iPod again). An amazing story, and it's hard to put down, because you want to know what will happen to General Robotwallah in Dharavi, the Jewish-American who took a Chinese name and learned Mandarin to play with a Chinese group, and is right now on the run from his father, Matthew in Shenzhen... I look forward to donating two copies of this book to libraries that need them (brilliant idea). 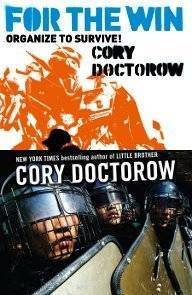 When I began writing this post, I was actually going to talk about a kind of fiction that I think Doctorow exemplifies, and so I began talking about when I first read Cory's novel. 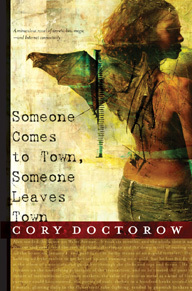 As I began sifting through old e-mails to figure out exactly where I was, and what I wrote to him, I thought it might be fun to just turn this into a "around the world with Cory's writings" blog post. I'll write that other post later. I look forward to many more excellent books, and I am excited to see in which strange places I will be reading them, and on what futuristic devices! Photo of Cory by Joi Ito, CC BY.